This month’s package was extra large! I like that! It was due to this annual impact report, which is really cool. I like knowing that this subscription is really making a difference! It is filled with stories of how Fair Trade Friday is making a difference in the lives of the less fortunate. Look at this beautiful bracelet! I am so impressed! This is real upcycled leather, handcrafted and hand stamped. It is also vegetable tanned and oil infused. It’s nice and thick, too. So, full disclosure, I have large wrists and arms. Thus, I think this would fit almost anyone, but it’s a wee bit tight on me. The good news is that leather stretches, and I love this bracelet, so it’s a definite win! I do think it would look amazing on someone with slender wrists, though. The Verdict: I am really enjoying my subscription to Fair Trade Friday Bracelet of the Month Club! This bracelet is so lovely, I just know I will get lots of use out of it. The value this month is also fantastic! $15 for a $40 bracelet! 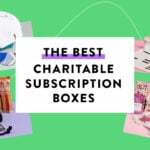 Plus, I love the charitable aspect of this subscription. Can you still get this box if you sign up today? No, you will receive the April box. Order by the 16th of each month to get that month’s box. I really LOVE that bracelet!! I love this bracelet. I’m going to try out this subscription.